Born at Bristol, England around 1887, he trained as an electrical engineer in England before emigrating to Canada in 1911. He took a job with the Winnipeg Electric Company and joined the Winnipeg Hydro-Electric System (precursor to Winnipeg Hydro) in January 1912. He served as Power Plant Superintendent at the Pointe du Bois Generating Station from 1915 to 1922. In 1922, he was appointed Chief Engineer and supervised construction of the Slave Falls Generating Station on the Winnipeg River. He was appointed General Manager of the utility in 1944, retiring in 1951 and being succeeded by H. Lee Briggs. From 1931 to 1945, he was a Commissioner (and Vice-Chairman) of the Manitoba Power Commission (predecessor to Manitoba Hydro). 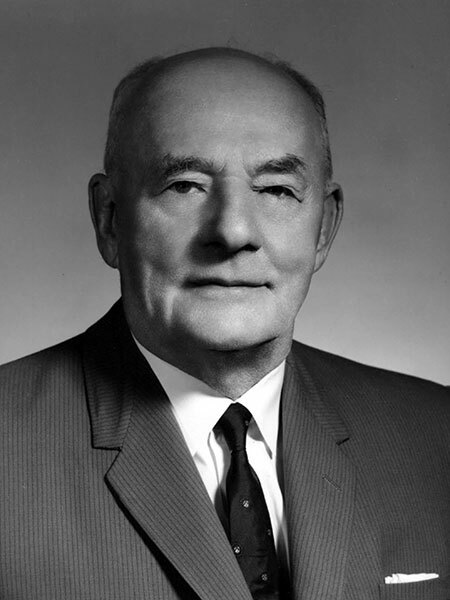 Following retirement, he was appointed to the Manitoba Hydro Electric Board, serving from 1952 to 1959. He was President of the Association of Professional Engineers of Manitoba (1932-1933), Chairman of the Manitoba Branch of the Engineering Institute of Canada, and Chairman of the Building Committee for the Children’s Hospital. In 1959, he received an honorary doctorate from the University of Manitoba. On 11 June 1914, he married Lauretta Alice Williams (c1889-1960) at Winnipeg. They had two sons: Lewis John Sanger (1921-1944) and William Russel Sanger (1925-1948), both killed at the age of 23. After his wife’s death, he remarried, on 5 July 1962, to Gwenda Mary Marshall (1921-2013). He was a member of the Masons (Capitol Lodge No. 136), Khartum Shrine, and St. George’s Anglican Church. He died of a heart attack at Winnipeg on 21 January 1966 and was buried in the St. John’s Cathedral Cemetery. “Toronto traffic smash kills Russel Sanger, 23,” Winnipeg Free Press, 5 August 1948, page 1. Obituary [Lauretta Alice Sanger], Winnipeg Free Press, 24 January 1966, page 26. Obituary, Winnipeg Free Press, 3 August 1960, page 32. “Hydro’s Sanger dies at 79,” Winnipeg Free Press, 25 January 1966, page 34. “Pointe du Bois celebrate centennial,” Springfield Leader, 25 August 1970, page 3. We thank Mary Finnegan for providing additional information used here.